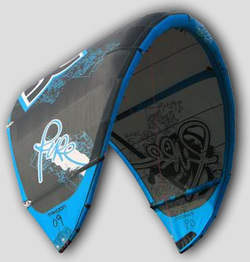 The Pure is a new kite for Takoon for 2010 aimed both wakestyle and wave camps. It is a Low aspect ratio delta style kite with a an optional PDS plug to add additional stability in the air. It has a fairly large diameter leading edge, bolstered with Aramid reinforcements and comes with one-pump inflation as standard. In the air the kite flies surprisingly far forward which translates to good upwind performance, and also delivers a very good turn of speed but can cause it to overfly on occasion. The kite has 4 rear line connection points which alters the turn speed from medium to slow. Bar pressure is medium and depower is what you'd expect from an SLE. Unhooked performance is excellent, with the kite not budging an inch when you unhook - unlike most kites it doesn't even notice. Relaunch is also very good indeed due to the highly curved leading edge - just pull on an outside line and the kite will pivot then make its way straight to the edge of the window with no fuss. Inserting the PDS allows the kite to sit back a little further in the window, adding stability and improving pop considerably, whilst reducing the upwind capabilities a little. For anyone using the kite for wakestyle, this is a more than acceptable compromise. The Pure's real strength lies in its unhooked performance, whether it be for wakestyle or unhooked waveriding. Besides this its all-round capabilities are very good, making it suitable for a rider of practically any level.